"My family loves this creamy and satisfying soup with the comforting flavors of butternut squash and curry. Serve topped with frizzled onions." Preheat an oven to 375 degrees F (190 degrees C). Line a rimmed baking sheet with parchment paper. Cut squash in half lengthwise; discard seeds and membrane. Place squash halves, cut sides down, on the prepared baking sheet. Roast in preheated oven until very soft, about 45 minutes. Scoop the pulp from the peel, and reserve. Melt butter in a large soup pot over medium heat. Stir in the onion, garlic, ginger, curry powder, and salt. Cook and stir until the onion is soft, about 10 minutes. Pour the chicken broth into the pot, and bring to a boil. Stir in the pears and the reserved squash, and simmer until the pears are very soft, about 30 minutes. Pour the soup into a blender, filling the pitcher no more than halfway full. Hold down the lid of the blender with a folded kitchen towel, and carefully start the blender. Puree in batches until smooth. Return the soup to the pot, stir in the half and half, and reheat. 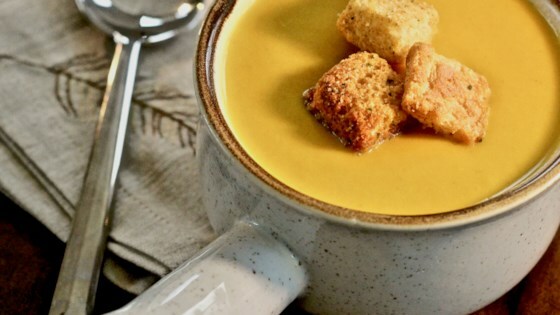 Watch how to make a comforting bowl of flavorful butternut squash soup. Serve topped with Frizzled Onions. Awesome recipe. Works with a variety of root vegetables/squashes/etc. We made it into a Butternut Parsnip and Rutabega Soup and got raves. This was delicious! Made as written except used dried ginger (1 tsp). Will make again.